For this year’s Converge45, a special four-day arts events based in Portland now in its second running, Ellen Lesperance contributed several highly charged works. Combining her focus on feminist acts of power and her meticulous attention to detail, her art serves a dual purpose: an assignation of strength and an exploration of the forms in which we protest and attain independence today. Two of Lesperance’s pieces are currently on view on the fourth floor of the Portland Art Museum’s Jubitz Center for Modern and Contemporary Art: W.I.T.C.H. 1985, a sculptural installation, and Beside the land of Chaldea is the land of Amazonia, that is the land of Feminye and in that realm is all woman and no man; not as some may say, that men may not live there, but for because that the women will not suffer no men amongst them to be their sovereigns, a painting from her Land of Feminye series. The first piece to be seen in the room is Lesperance’s painting, Beside the land…, on the right side of a wall that obscures her larger sculptural work. Considering the way the works are staged, and the fact that the series was done several years prior, it seems as if this painting acts as a loose prerequisite to better understanding her larger installation. Done with gouache and graphite, at first glance the painting is rich with color and vibrant pattern. Upon closer inspection, the intricate subtleties of her labor-intensive process become even more apparent and dazzling. 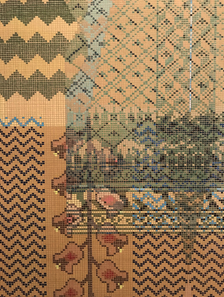 The entire painting is done on meticulously hand-gridded and tea-stained paper evoking the idea of female craftwork in the textile field. In fact, it is precisely the sweater patterns of 1980s female protesters in the UK that Lesperance had in mind when painting these works. By creating these images, Lesperance hopes to communicate the resilience and long-standing dedication of feminist activism; its tight-knit community mirrored in the tightly knit weave of her painting. The entire title of the piece is written in the left and right hand corners of the painting in such a way that “the land of the feminye” and the notion that “[the] realm is all woman” cannot be ignored by the viewer. Forced to engage with it so directly, and having to “read” the painting so literally, the audience is meant to subvert their preconceived ideas of female-created textiles in conjunction with female-created resistance. These same ideas of subversive [text]iles and symbols of protest are repeated in Lesperance’s installation piece in the room adjacent. Tucked away in the corner, for purposes of dramatic effect and diminishing light interference, is W.I.T.C.H. 1985, shrouded in mystery and influence. Sculpted with fabric, ribbon, glass beads, embroidery, ink, paint, wood, cardboard, and concrete, this mixed media installment carries a fierce symbolic weight. The thirteen garments recall the protest robes of the Greenham Common Women’s Peace camp, an all-women anti-nuke camp of the 1980s. 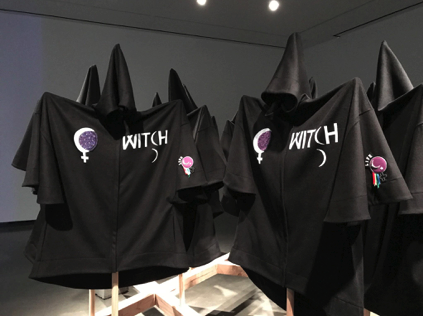 The robes are ominous, featuring popular women’s power symbolism of the era such as multicolored ribbons, the crescent moon, stars, and the word “life” repeated on each robe. Placed in the center of the room, this work requires the viewer to walk around the installation and fully engage with it in order to notice its deliberate design. By circling around the hooded figures one can recognize the subtle differences in their embroidery, their poses, and the wooden pentagram shaped base to which they are all attached. With the lights dimmed purposefully in the room, the shadows at play also add an intriguing and pointed element of mystique to W.I.T.C.H. Faith and strength combine forces here -- the rough, unfinished wooden base supports the piece and provides structural balance, and its pentagram shape connotes a more mystical statement of vitality to the work. The cloaks are most likely also associated with the socialist feminist group of ‘68 W.I.T.C.H. -- the Women’s International Terrorist Conspiracy from Hell. Like both W.I.T.C.H., the protest group, and run-of-the-mill storybook witches, Lesperance calls upon the collective powers of the occult and, more broadly, the valor of femininity in order to create works of art that stand independently as forces to be reckoned with. Thematics and historical significance playing a strong role in these pieces, Lesperance demonstrates the need for creation and return of agency to the female voice. For the artist, woman is meant to be her own sovereign and woman’s capabilities to enact change and movement are unparalleled. Lesperance creates an arena for her audience to consider the role of female solidarity in spaces/times of tumult and consider the manners in which it has both been heard and silenced. Quite topical in our current national climate, these two works fervently demonstrate woman’s rise to power in the field of protest and urge for a continuation of these same trends. Ellen Lesperance represented by Adams and Ollman, and her exhibition The Subjects is accessible at the Crumpacker Family Library, which runs through November 5th.